The TGA's reporting system for adverse events began in the late 1960s with the computerised database dating back to the early 1970s. By the end of 2016 there were approximately 329,000 reports of suspected adverse events in the database. In 2016 the TGA received approximately 17,000 reports of adverse events. As shown in Figure 1, the majority of reports made in 2016 were by sponsors. The number of reports made by sponsors increased from 2012 (8211) to its highest point in 2013 (9563), before dropping back to a similar level in 2014 (8359). Sponsor reports rose again in 2015 (9286) and maintained a similar level in 2016 (9080). Of the 17,000 total adverse event reports received by the TGA in 2016, approximately 54% (9080) were from sponsors; 17% (2824) from State and Territory Health Departments (reports of adverse events following immunisation); 11% (1934) from hospitals and hospital pharmacists; 6% (969) from consumers; 5% (903) from community pharmacists; 4% (639) from general practitioners (GPs); and 3% (567) from other sources. Compared to previous years, the biggest increases in reports were from State and Territory Health Departments (up from 2516 in 2015 to 2824 in 2016) and consumers (up from 654 in 2015 to 969 in 2016). 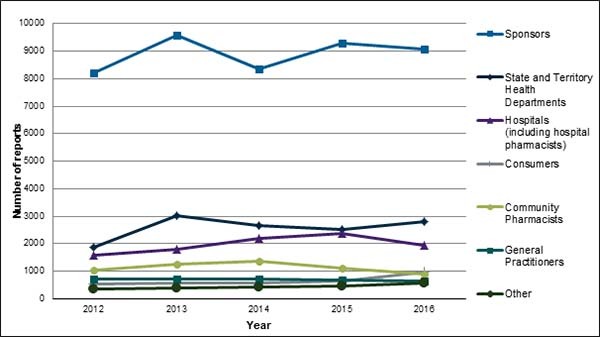 The increase in reports from State and Territory Health Departments may relate, in part, to two additions to the National Immunisation Program in 2016 - the 18-month diphtheria, tetanus and acellular pertussis-containing vaccine (DTPa) in April and Zostavax in November. There was enhanced surveillance related to these vaccines and significant promotion about the importance of reporting adverse events following immunisation. For further information about reporting suspected adverse events, visit the TGA website (click on 'Report a Problem'). The Advisory Committee on the Safety of Medicines (ACSOM) was established in January 2010 to provide expert advice to the TGA about safety issues under investigation and the appropriateness of Risk Management Plans (RMPs). RMPs outline sponsors' plans to monitor and communicate risks, and are evaluated as part of the registration process for new medicines. RMPs accompany applications for registration of high risk medicines, such as new chemical entities. RMPs characterise and pro-actively manage risks relating to a medicine over its entire life cycle. ACSOM also provides advice to the TGA on other matters related to pharmacovigilance, including the detection, assessment, understanding and prevention of adverse events. ACSOM meeting statements are published on the TGA website. The functions of ACSOM were consolidated into the Advisory Committee for Medicines on 1 January 2017. Following a recommendation from the government's Review of the management of adverse events associated with Panvax and Fluvax in 2012 'to consider the current governance arrangements for monitoring and responding to vaccine safety issues in Australia and make recommendations for an improved system of governance for vaccine safety monitoring', the Advisory Committee on the Safety of Vaccines (ACSOV) was established in the Therapeutic Goods Regulations. The functions of ACSOV are to provide advice and make recommendations to the Minister for Health, the TGA and the Office of Health Protection on the safety, risk assessment and risk management of vaccines. ACSOV meeting statements are published on the TGA website. The functions of ACSOV were consolidated into the Advisory Committee on Vaccines on 1 January 2017. The Medicines Safety Update was published five times during 2016. It was published on the TGA website. Medicines Safety Update replaced the Australian Adverse Drug Reactions Bulletin in 2010.